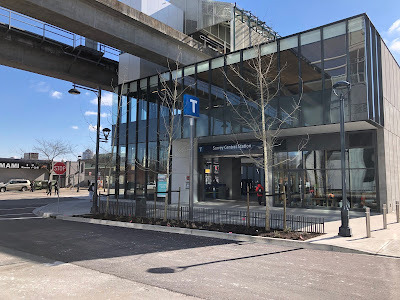 The South Fraser Blog: $1.86 billion in Expo/Millennium Line Upgrades. Delays in receiving new SkyTrain cars. $1.86 billion in Expo/Millennium Line Upgrades. Delays in receiving new SkyTrain cars. One of the components of the Mayors’ Council and TransLink’s 10-Year Vision to improve transportation in Metro Vancouver is the renewal of the Expo Line and Millennium Line. Some components of the SkyTrain system are over 30 years old and are starting to show their age. They need to be renewed. Also, in order to accommodate the growing number of people that are using the SkyTrain network, upgrades need to be made to stations, power systems, and communication systems. New rail cars are also required. In total, $1.86 billion is currently being invested into the current Expo and Millennium Lines. The largest capital item is the renewal of the SkyTrain fleeting which includes purchasing 259 new rail cars to accommodate growth and replace aging cars. The first batch of 56 rail cars was ordered at the end of 2016. According to a TransLink report, there are some delays in delivery. Manufacturing and testing delays by Bombardier. Trains 1-3 undergoing commissioning in Burnaby OMC. Trains 4-5 undergoing testing in Kingston. Bombardier preparing recovery plan to reduce schedule delay. A quick search of “Bombardier” and “delays” yield some interesting results when it comes to the delivery of rail cars. Progress is being made on getting the contracts in place for the delivery of the next 203 rail vehicles. Work is also being done to upgrade the automation systems that control the trains. This work is expected to be completed at the end of 2021. Upgraded Surrey Central SkyTrain Station. Select image to enlarge. Finally, Burrard Station and Brentwood Station will be receiving upgrades as part of the 10-Year Vision investment program. Joyce Collingwood Station is currently being upgraded. The following stations have already been upgraded: Main Street/Science World, Surrey Central, Commercial/Broadway, Metrotown, and New Westminster Station. More information about the upgrade and renewal program can be found in the latest TransLink Board Open Meeting reports document.